Hello there Doodlebugs! 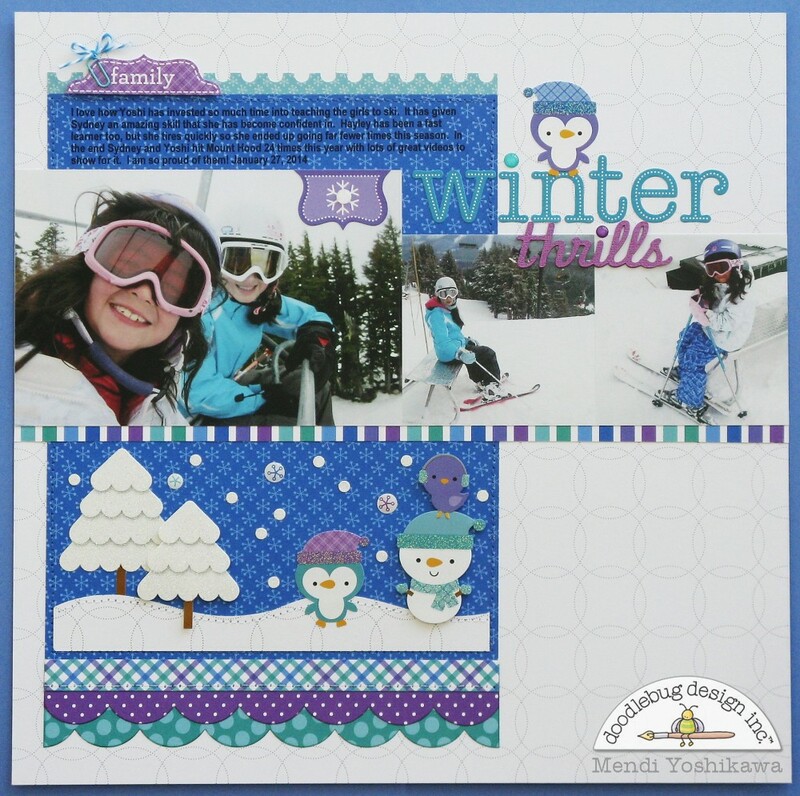 It's Mendi here today with a layout using the darling Frosty Friends collection. With all the snow we received last year and my daughters' love of skiing I was overjoyed when they announced this newest release! I adore all the fun new glittery sprinkles and sprinkle shapes! And many of the stickers have a dusting of glitter as well! The colors are perfect matches for all your winter gear and there are so many beautiful patterns which are fun for layering! I know I am going to get lots of use from this beautifully versatile collection--I can't wait to find time to play with it some more! I love this fun LO. wish i could ski. Oh my! Pinned for sure! We got more snow than normal last year too (like most people) and when it wasn't -25 degrees outside we got some great pics of the kids playing in the snow. I love the penguins in this set! So cute! This is a pretty awesome layout, the colors in this collection are adorable and the picture in thes layout are fantastic! I love the cute elements in this winter collection! Great layout! I pinned another close up--so cute. What a fun layout! I love the stitching and layering. 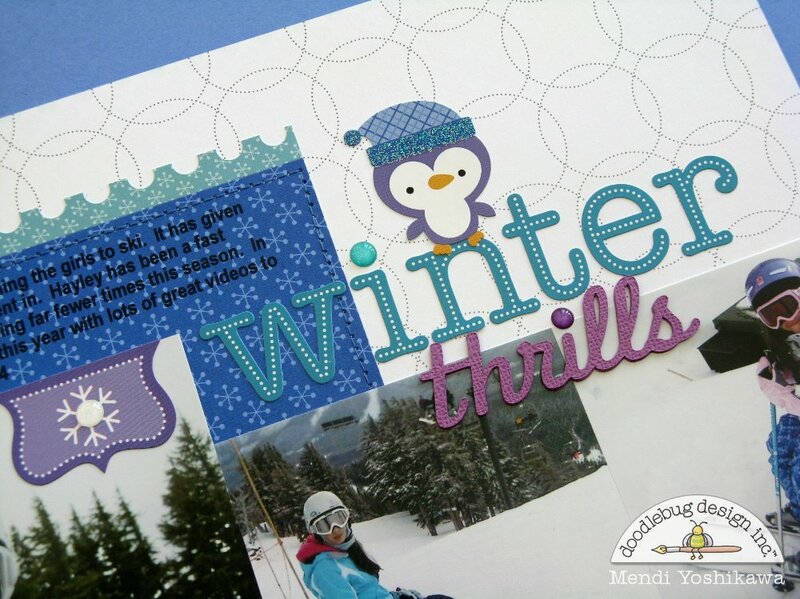 Beautiful layout, I love the look of the stitching and all of the gorgeous layers! The scalloped border is another fun element! Love this layout. I pinned a picture of the small scene in the lower corner. Love it. Your pics are Fabulous your daughter is so cute and is awesome that she loves to skii!! Your LO is outstanding you did one super creative job. I am a die hard scrapper since 2004 and I know what you mean about things that come out that are ever so perfect for what you're scrapping this is awesome!! You are a very talented scrapper!! Very cute and still pinning! Love the lines on this layout! Perfect!! How amazingly adorable is this!! !